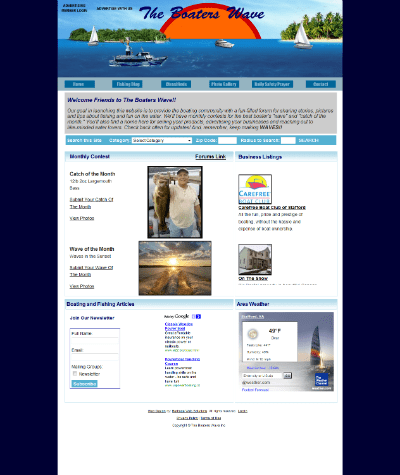 Project Description: TheBoatersWave.com is a business listing site associated with boating and fishing. Site visitors can pay to have their business listed on the site. Searches can be performed by category, zip and radius. For this site we implemented pre-built software packages with custom programming. Anglers and boaters can upload their pictures to the monthly best picture contest. All submissions can be viewed. Administrator can add, edit, delete, list, approve and deny all business listings. Admin selects monthly contest winners and controls which pictures are displayed on the home page.